Rey Ciso (Adam Brooks) was once a famous film editor, but a bout of insanity while working on the world’s longest film caused him to cut off his fingers. Now sporting wooden ones, he’s relegated to splicing together cheap giallo films. When the cast of the production he is working on start getting murdered in ways that mirror events of the film, the police immediately suspect him. Rey has to piece together the mystery while his own sanity is slipping away. The actors, the director, even Rey’s own wife are suspects, but Rey realizes that he can’t trust anyone, especially himself. The Editor is by Astron-6, the creators of Manborg (2011) and Father’s Day (2011), so if you are familiar with their output, you know what you’ll be getting here. For those who haven’t had the pleasure, I’d hesitate to call their work spoofs, they are more pastiches that descend into absurdity. Their target this time around are Italian giallos (hybrid mystery-slasher films) and 70s and 80s horror films. They nail many key elements, the look, the sound, and the convoluted plots. In fact, the homage works so well, it often feels like the humor gets in the way. But on the other hand, actual Italian films from this period weren’t above some overt silliness, so it can add to the authenticity. This movie looks stunning for something made for less than $100,000. 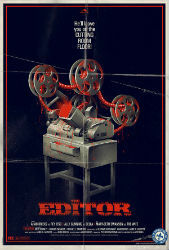 The Editor is beautifully bizarre horror-comedy.